17-09-02 = R. arkansana X 'Carlin's Rhythm'. I'm determined to obtain a seedling from the delicate-looking-but-unbelievably-tough R. arkansana, a North American native. The species has richly scented single candy pink blooms, and certain select clones sometimes have subtle stripes or streaks of darker color on the petals. Mine doesn't, but mine does do something I hope to capitalize on; it blooms at least three times in the growing season: late May, again in July or early Augustm then again in late September or October. My specimen of R. arkansana is a reluctant seed setter, rarely accepting pollen from anything but itself. However, I did manage to get two seedlings from a cross using Kim Rupert's beautiful 'Carlin's Rhythm'. This is the second of the two (the first was paler and not as nice) and displays large-ish blooms (about 2.5") in a deeper than average rose pink. The scent is rich and pure "old rose". Now, the trick is to try it in breeding to see if I can make the next step. It will have one copy of the modern hybrid remontancy gene, and at least once copy of the gene that makes my arkansana repeat, which may or may not be distinct from other forms of remontancy. As both parents are (at least in principle) tetraploids, I would expect this seedling to be a tetraploid also. The foliage of 170-09-02 looks like R. arkansana to me....the species is everywhere out here on the prairie, but I haven't noticed any repeat blooming. I'll keep watch. The foliage leans heavily towards the species parent, indeed. In fact, I would not be surprised to find (eventually) that it is just a selfing of the parent arkansana. It happens, no matter how carefully you emasculate a bloom. But the bloom color is so much deeper than my arkansana that I am inclined to think it is a hybrid. The proof will be in the first generation of offspring. 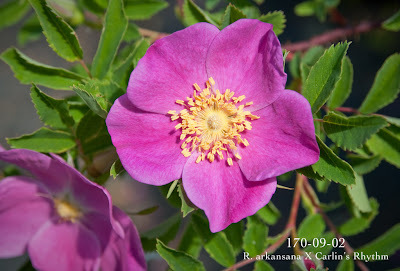 FYI my clone of R. arkansana was grown from seed many years ago, from seed given to me by a Denver rosarian who collected it from her personal specimen. I gather several strains of R. arkansana rebloom much like mine does, you just have to identify such a clone. I was lucky. Kocham róże i chętnie czytam o nich wszystko, co możliwe. I wanted to thank you so much for your "Old Garden Roses and Beyond"; I have used it as a purchase guide for many years. A friend of mine contacted me yesterday about how to choose her first roses; I steered her to you and a couple of other sites, and after what she described as several hours of happy clicking, she ordered three peach roses including Jayne Austen. Your site is beautiful, helpful, and informative; thank you so much.